Setting "The Ten Most Overrated Men in New York" record straight. We can’t really fault WNBC reporter Gabe Pressman’s 91-year-old memory for being a little hazy. At the end of a wonderful profile by Wall Street Journal columnist Ralph Gardner Jr., Pressman states that when he and the others anointed by New York magazine in 1972 as “The Ten Most Overrated Men in New York” were invited to a party at the Towers of the Waldorf Astoria by then-U.S. Ambassador to the U.N. George H. Bush, also on the list, only one of the honored failed to show up – Senator Jacob Javits. 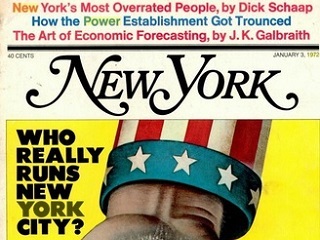 But if you go back to the magazine’s “Between the Lines” editor’s notes that followed the publication of that list in the Jan. 3, 1972 “Power Issue,” it turns out Javits was out of the country at the time. And that two others on the list also couldn’t make the Bush tongue-in-cheek celebration: Terence Cardinal Cooke and Steve Smith. Gardner certainly has a fun beat. A few days ao, he also got to play ping pong with Rafael Nadal.